A collection of transliteration of famous English poems. Almost all branches of English poetries are introduced with examples from the works of Shakespeare, Wordsworth, John Keates, Alexander Pope, Tennessee Williams etc. A best book for children to acquaint with the various branches of English. Often students confuse about the differences between various branches of English poetry such as ballad, elegy, ode, satire etc. 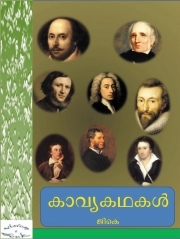 This book, a transliteration of English verses to Malayalam, gives a detailed description of the differences with a retelling of famous poems of Mathew Arnold, John Keats, Shakespeare, Tennessee Williams etc. A good hand book for beginners.